Overall distribution of weights/volumes in the entire sample lot must conform to a pre-determined statistical model. Production data gathering is a labour-intensive task that leaves room for errors and potential information loss – manual gathering of sample data is complex, time consuming and costly. To accomplish the above (collect and retain all relevant data for every single piece of goods produced), factories have often resolved to sampling and using statistics. This standard practice is well accepted by the industry; however because of the nature of sampling process, it often results in erroneous data and thus requires that the margins of error are visibly accounted for. Product traceability has many advantages that result in improved yields and is vital to managers who need to analyze and optimize their operating practices. Although inspections have been extensively practiced before, those inspections are not well automated, offering room for automation to be introduced into the quality control (QC) processes. Automation can provide an audit trail that allows managers to find and correct faulty processes swiftly thus avoiding production quality issues. Relevant and well defined manufacturing data flags potential problems before they result in in a product recall. 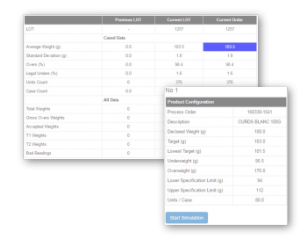 Having all manufacturing data collected in one place aids in production performance management eliminating giveaways and allows targeting to be done with a reduced margin of error. LT3 is an automated data gathering tool that helps in data collection: to provide for productivity improvements, data is automatically collected, stored and presented to users in a contextualized, relevant and timely manner. 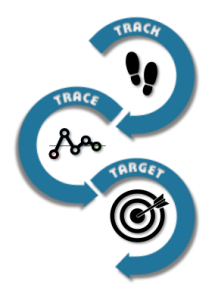 The software is a fully automated tool for complete, real-time data acquisition (Tracking), product traceability (Trace) and parameter targeting (Target). Developed and designed over the years with input from production managers and operators, it is in use in various manufacturing facilities in the Food and Beverage industries, producing measurable operational efficiencies, and most of all, cost savings through lean operations. Query reports for analysis by Line, Product, Shift, Lot, etc. In applications where products need to be cut to size, weighed and packaged, LT3 solution helps in assuring the compliance with the requirements outlined in the “Canadian Labeling and Packaging Act”. 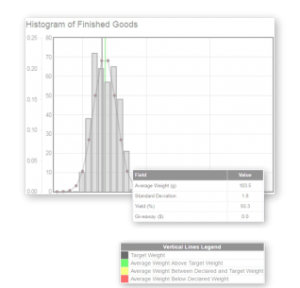 As the product is cut and weighed, the system tracks all resulting pieces and graphically traces the average weight of the group of finished products. In addition, it also records and posts the required scale (Checkweigher) tests, prompting the operator to take corrective action (if necessary). 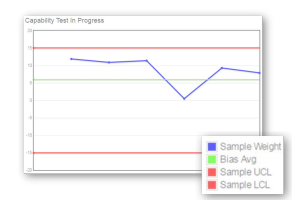 This test is performed by weighing a specific product sample multiple times to confirm that the results fall within the pre-defined upper and lower limits with the average of the bias within these established limits. All the data is presented on screen in real time and is also available as a report. Should the scale readings be “out of spec”, the operator is requested to verify various parameters as per help checklist. The same procedure is utilized for the rejects test. Here, the same confirmed reject sample is weighed multiple times with the expectation that it is always rejected. This action has to be confirmed by the operator. 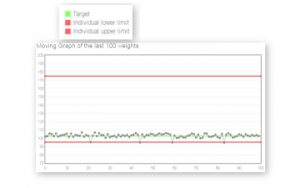 This test is designed to determine the measurement capabilities of the scale by calculating the upper and lower bias, as well as the standard deviation. The test is based on a known sample that is weighted up to 100 times with the statistical data determined from obtained results. The report generation capability of the LT3 solution is a powerful tool for plant management personnel. It provides for analysis of the manufacturing data and calculates vital information to accomplish lean manufacturing operations, regulatory compliance and audit trail. Acquired data is displayed on supervisory screens and the production lines in real time detailing information about the production throughput and obtained line efficiencies.